At nineteen years old, Bas Klarenbeek has already started down the path of entrepreneurship. A lifelong passion for baking and confectionaries became a dream to own his own pastry shop and then to sell his products online. With the help of Qredits, YBI member in the Netherlands, Bas was able to turn his dream into reality. Then at 16, Bas gained a chance to work at a bakery in Kuwait where he was introduced to his second great passion: chocolate. The Kuwait trip was a first in many ways for Bas: it was his first time on a plane and, more importantly, his first time truly being inspired to make his own culinary designs – and learning that people would be interested in paying for them! Such was the impact of this experience that he in fact chose to write a report on his trip as part of his final grade at school. It was at this point that Bas decided to give up a place at university and enrol in a Vocational College specialising in Pastry and Chocolate. Here, he was able to take a course on entrepreneurship – which is how he got a clear idea that he wanted to start his own business. The entrepreneurship course inspired Bas to elevate his dreams from just being a chef or owning a bakery to creating his own unique business scheme namely to sell own customisable goods online. His business venture would start on two lanes: selling products online and hosting workshops in his own kitchen, sharing his baking skills and teaching others how to make products like his at home. For the workshops, he has even bigger dreams. “I want to go to schools and teach [kids] the specialties of chocolate” giving children a chance to have fun and pick up some amazing life skills. Bas’s larger aim is to truly present the scientific detail and skills needed to make the highest quality chocolate as well as selling his high quality items in a way that suits the customer’s discretion. Although he is still currently at school, Bas was fortunate enough to come across an entrepreneurship program offered by Qredits, where he received invaluable advice for when he truly sets out into the business world. Aside from helping build Bas’s confidence in his ideas, Qredits programme taught him about producing his business plan and working out how to pitch his ideas to potential supporters and the Dutch Chamber of Commerce. Qredits provided Bas with the expertise in technical terminology and business modelling to convince numerous potential supporters to invest in his dream. Like every budding businessman however, Bas faced challenges, particularly in the field of pricing management; Qredits helped him successfully gauge the correct pricing for his products and move him swiftly on the road to developing his business. 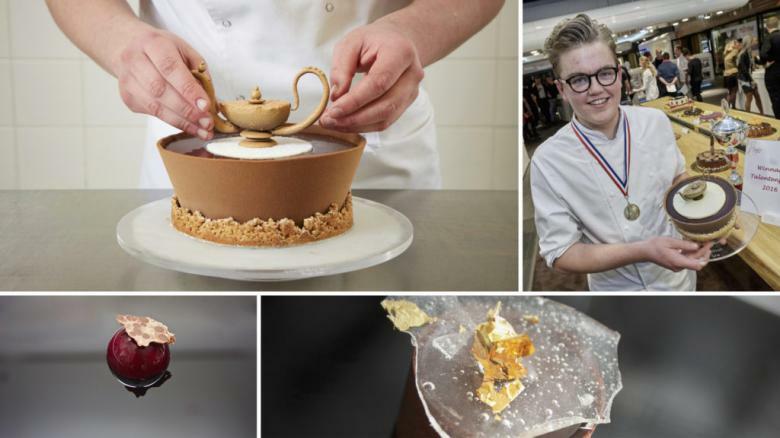 Bas’s primary aim is to sell chocolate goods and pastries online, custom making products to order, as well as selling a variety of his own creations. With entrepreneurial zest, Bas took the wisdom his grandfather taught him and created a dream where he can’t only make quality products and build his own business, but, being all about sharing, also help other people to create and enjoy their own wonderful creations. To this day Bas is using the techniques and wisdom instilled in him by his grandfather and he dreams to bring his recipes and ideas not just to his local community but to as many people as he can reach. Bas’s story is truly impressive – not only because he started his entrepreneurial journey at such an early age, but for having such a clear business idea born from a lifelong passion and for aiming to use it to make a contribution to other people’s happiness. Bas is one of the many entrepreneurs Qredits helped start or grow their own businesses. Qredits is part of the Youth Business Europe regional programme, supported by the Citi Foundation.